You are here: Home / Patrol Method / The Authority of Youth Leadership. Force or oblige someone to do something. 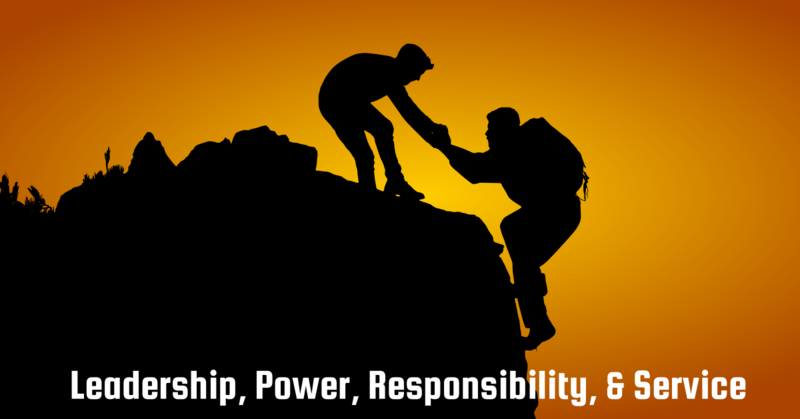 To give or commit (duties, powers, etc) to another as agent or representative. Give someone the authority or power to do something. 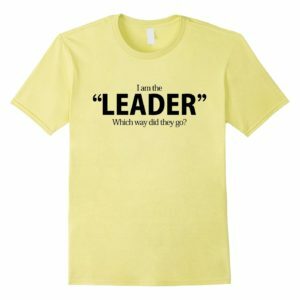 The authority of youth leadership is not based in compelling young people to do something. 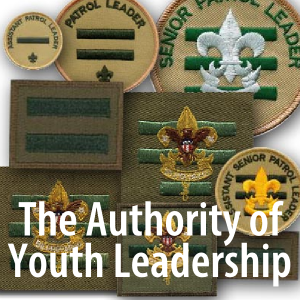 The authority of youth leadership is built into the fabric of Scouting, they are empowered to lead. Youth leaders are not servants, employees, or soldiers but volunteer players in the purposeful game of Scouting. Scouting is something that Scouts do for themselves and adults have the honor of observing, coaching and encouraging. Adult authority is provisional; we are there to assure things are safe, and that our youth leaders are playing within the bounds of the game. 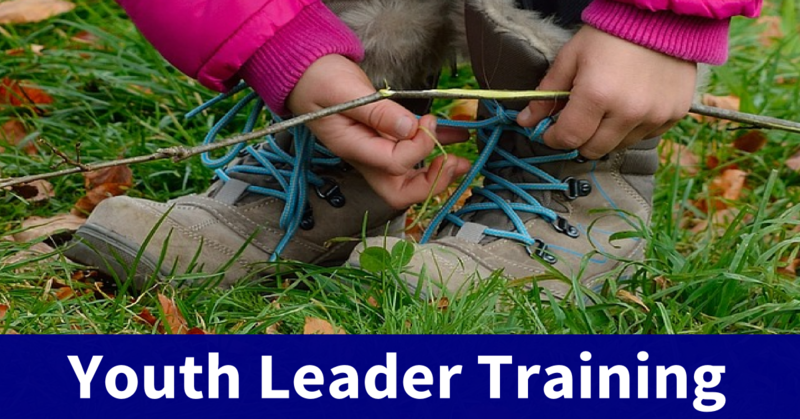 Adult leadership is responsive and reciprocal to youth leadership: we provide assistance to developing leaders in the same way we teach someone to ride a bike, by letting go when they are ready to pedal on their own. 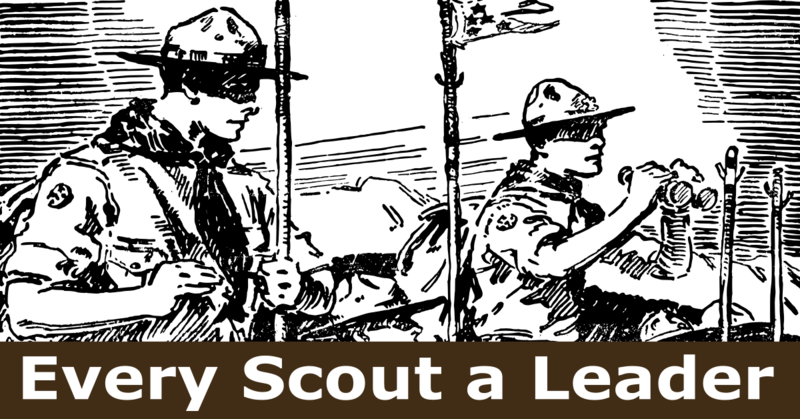 New question: can the “Scout led” concept be taken too far? My SPL asked if the scouts could hold their weekly troop meeting with no adults in the room. He also told me that they are planning to do mountain house style food for our next campout even though it is a tailgate/snow campout. When they discussed this in their PLC, they got excited when he said it was very easy to prepare and no cleanup. He also omitted patrol meetings from the last troop meeting and spent most of the time “instructing” fire skills in a way that looked to me like “playing with fire.” Any thoughts on how to help them discover the benefits of having adults in the room, cooking/cleaning up as patrols, using the EDGE method of instruction and holding their patrol meetings? I am really worried about this problem because we have transitioned to a scout led troop and are seeing great success. But in the PLC after the meeting they talked about the problem of the younger scouts not listening to them and respecting them when they try to get order and they don’t know how to handle this. They have tried punishment (pushups, not getting rewards), rewards (candy), etc. all to no avail. My assistants and I have discussed this and can relate because if we were standing up there in front of 20 12-13 year olds, we would have the same discipline problems. I have been thinking a lot about this because we have such a great thing going and I don’t want to lose it. acclaim him; worst when they despise him. -servant leadership is the key to our PLC solving these problems; they need to have faith in these younger scouts, listen to them, understand their world, help them solve problems and overcome challenges; we have to earn respect as leaders, it cannot be won by commanding it. This is discussion is found on podcast #55, about 5 minutes into the podcast and lasts about 10 minutes. It is the best guidance on this topic I have ever heard. I highly recommend it to all Scouters. Thank you, Clarke for these awesome resources that help those of us who “are in the trenches” go back to the basic principles that are timeless, they work and will help us carry forward this great movement. You are working on a long-term project, and you’ll get better at it as time passes. Observe, study, and make adjustments. As your understanding of the work increases you’ll see where changes need to be made. I love this post. it goes to the heart of scouting. I am a Scoutmaster trying to implement these principles and we are having great fun and progress but are still growing and learning. We had our Troop Meeting last night and, like all of our recent meetings and campouts, was clearly Scout-led. However, our SPL likes to be in the limelight, just like I do if I don’t check myself, and most of the meeting was him instructing/demonstrating fire building. We had 20 scouts gathered around, somewhat noisily and at times rambunctiously, watching. I felt like our SPL spent too much time doing the demonstrations with the troop simply observing instead of engaging them in activities and “doing” what he was trying to teach them. He wanted to demonstrate fire by friction, but it has been awhile since we have learned that and he was – not unsurprisingly – unsuccessful. He turned to lighting steel wool and trying to get it to burn, then, at the suggestion of one of our ASMs, went into the parking lot away from the troop and lit a piece of steel wool looped around a rope and swung it in circles, which created a fireworks like display. The scouts seemed to enjoy it, but this activity took up most of our meeting. 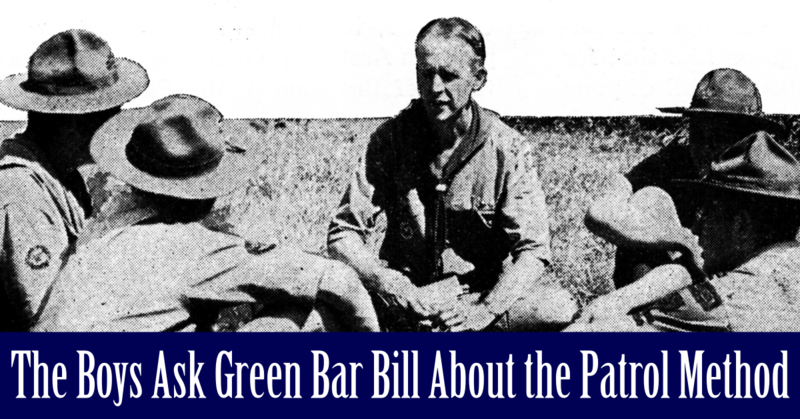 There were no patrol meetings or patrol activities but they then played a game, which all of the scouts enjoyed and didn’t want to stop when the meeting came to a close and parents were anxiously waiting. I know I need to do some mentoring to help my SPL improve on what he is already doing. My question is, what is the best way to mentor so that I encourage, teach and inspire, without sounding critical and negative to my SPL? And, do I mentor the entire PLC or just the SPL and let him mentor the rest of the PLC? How much advice do I give him so he is not overwhelmed and think I am the enemy? Should I be meeting weekly or at some other regular interval with my SPL or PLC to do this kind of training? Should this be me training the SPL or me and my ASPLs training the PLC or what? How do we do this? I feel like we have a great thing going and don’t want to ruin it but I also want to help these Scouts grow and develop in their leadership skills. Any thoughts from anyone on this thread would be much appreciated. 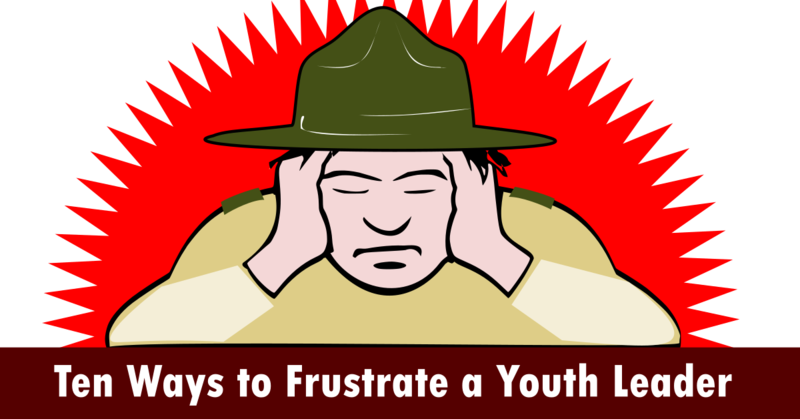 It’s important to reiterate the relationship between the Scoutmaster and the youth leadership; we are not their bosses or commanders. We are in a supporting, facilitating role. 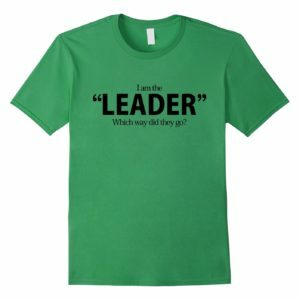 We recognize and respect the authority and responsibility of our youth leaders. Our chief activity is not actively advising, directing and mentoring every moment; our role is observing and reflecting. Put yourself in the role of a coach, stay on the sidelines and off the field. Let the Scouts play the game and then reflect on their performance afterwards. Ask how things went, what they think went well. Honest, useful reflection with a group of Scout-aged boys may be slow and difficult. Be patient, keep it to a few minutes at the most, Boys are especially sensitive to criticism,even good-natured ribbing may be taken the wrong way. The point of reflection is guiding youth leaders to discover what’s happening, not to be told what’s happening. Clarke, thanks for the original post and response to my questions. It takes a lot of guts to do this right. A lot of self-restraint to make this really go the way it should. Thanks again for being a beacon of light in a day when our youth are dominated by adults. Great post. This is the one the things I keep emphasizing to our leadership group. Currently, I observe some of the adult driven part and not enough of the boy driven part. The clarity of roles is important. 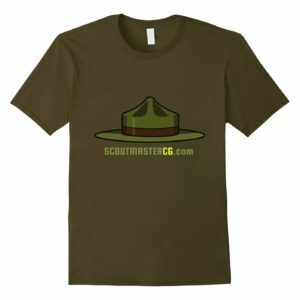 A part of me really wishes we weren’t called “Scoutmaster” and instead called something like “Scout Guider”. I know that Varsity (Coach) and Venturing (Advisor) use other terms that indicate more of this relationship. I think at some level it adds to the confusion of your role as an adult in a Troop. For a Pack it’s one thing, where the Cubmaster IS the one leader for all. 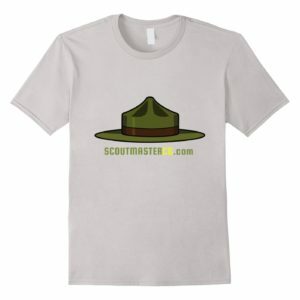 In a Troop, I’d almost like to give the Scoutmaster badge to the Senior Patrol Leader and give the top adult leader post the title of Guider or Advisor. That’s really the role you are playing. 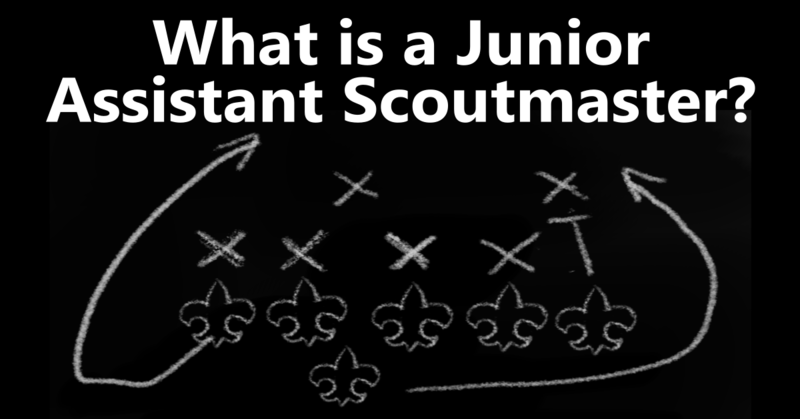 Read this post about the title Scoutmaster, the title, the way it is generally depicted, and the actual role are at odds with one other. I absolutely love this post. So many want to control the outcome of the meetings and not let failures happen. Who hasn’t learned from a failure? But for some reason, a lot do want their children to fail or make a mistake. That’s the greatest learning moment. I really, really enjoyed being a scoutmaster for the exact reasons you stated in your last paragraph. It is amazing how easy it is for the empowerment to be destroyed. 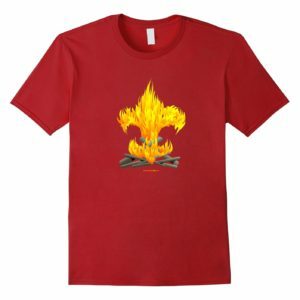 My son’s troop just had one of the old guard, who was quite intimidating and basically had a strong enough clique that the CC (me) couldn’t fire him (though he truly deserved it – but that is another story), have to retire (great) for health reasons (not so great). Remove his glowering from the sidelines and occasional shouts at the scouts and suddenly the scouts are running the show. Fantastic post. We just had that talk the other night. I wish more people understood that this is the way it works. Have a Great Scouting Day!